If you are looking for a doll for your daughter's birthday, you probably already know that Disney and Mattel make the world's most popular dolls. But these companies produce all kinds of dolls, and you may be wondering which type and what size to get. We don't think you can get a lot of enjoyment out of mini dolls which are about 6 inches tall, and we would recommend to consider dolls that are 18 inch and over. The Mattel American Girl and the Disney Princess doll families are some of the most beautiful and popular 18 inch-plus dolls available in today's doll market. The American Girl dolls are based on teen girl characters reflecting teenage girls from the American history. Today the doll line-up has expanded to include dolls that reflect contemporary girls as well. The company originally called Pleasant Rowland, became a subsidiary of Mattel in 1998. 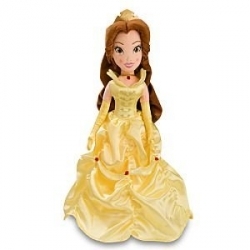 The Princess dolls are produced by Disney Princess which is a Walt Disney Company franchise. They are based on fictional characters from well known Disney stories. Note: Mattel also produces the popular Monster High doll family, the characters of which are inspired by monster movies (Monster High is actually a franchise of Mattel). These are smaller dolls, and therefore will not be reviewed here. However, if interested, you will find them as well below on Amazon. We will provide a concise but hopefully useful review of the American Girl and Princess doll line-ups, to help you buy the best doll for your kid. The American Girl dolls have dominated the 18 inch doll market for 24 years. They are very popular, high quality, but fairly expensive. They offer nice features such as a variety of hair and eye colors as well as different skin tones. Each doll comes with a costume representing a different period in American history. The shoes and the clothing are very well made, and you can even find matching dress sets for your daughter and her American Girl doll. The book that comes with the doll is fun to read, and it is filled with adventures that your daughter will love! Each doll represents a wholesome and interesting character for young girls to emulate and play with. Note that these dolls are of very high quality and are meant to be collectibles, and therefore need to be treated as such. If they are expensive, yet so popular, it is because they are really wonderful dolls. All in all, if you can afford them, they are a great way for your daughter to start off a doll collection and certainly should be considered if you're looking for the best doll for her. The Disney Princess dolls are high quality products at a surprisingly low price. They are around 20 inch tall and come with all the features that girls love in a doll. Clothing you can change, nice soft hair for brushing, fancy slippers, earrings that come off, etc. Each Princess doll is fully costumed in intricate detail with delicate embroidered features and rich fabric textures. You can buy matching outfits for your girl and her dolls. In addition to the doll, your girl will get a cute package of information that welcomes her to the Royal Family! She can then sign up for the Royal Club and begin her "magical journey". Well, that is what Disney is about! In addition, the doll comes with a magazine that provides your daughter tips on having a tea party or a slumber party, and of course on how to dress like her dolls! Disney Princess line-up includes dolls such as Snow White, Cinderella, Sleeping Beauty, and Rapunzel, and a number of different outfits both for your daughter and her dolls. So which doll is the winner? What makes a specific type of doll better than a different type? Appearance and quality are of course very important, but a good doll is also supposed to spark your girl's imagination and help her enter an imaginary and magical world of play. In terms of quality and appearance, both the Princess and American Girl dolls are a success in their own way. But with regards to setting off the imagination of your daughter, probably the Disney Princess dolls are more effective. The fancy clothing, the Royal Family certificates, the pledges to be a good friend and Princess, and other elements offered, all contribute to get your girl embark on a fantasy world. Also price-wise, a Disney Princess doll costs less than three times the price of an American Girl doll! But the American Girl dolls are not to be scorned either! These are high quality, full of tradition, both educational and entertaining collectible dolls. They just cost more. So, the bottom line is, if you are looking to create more of a magical world for your daughter and pay much less, go for the princess dolls. Otherwise, you should definitely consider the American Girl dolls as well. Either way, you'd be buying a great doll for your girl. Please note that you can choose and purchase securely your American Girl or Princess dolls right here (below) on Amazon.